Socks, or lack thereof, a kid sister, stalking wheel barrows and hitchhiking. That about sums up training week 16. Oddly enough, I did not feel this blister at all. It was only as I was stretching that I noticed it. I did feel the ones on both my heels though. Those I had to tenderly care for and tape until they callused. Still heel taping, I headed into the Lakes Region of NH for a session with Kale. We met at a small park and headed into the woods for a quick warm up run. I followed Kale around a small pond and onto an old woods road. The woods road went up a steep incline to a iron gate. The last time I was here, he had me running hill repeats. We were walking and talking at a brisk pace by this time when Kale suddenly stopped and exclaimed “who put this out here!” I wish I had my phone with me and could have taken a picture. Off the woods road and in the brush, was a wheel barrow filled with a pair of weights, a battle rope and an awkwardly shaped block of wood. All of a sudden hill repeats sounded much more manageable now! What did I do with this paraphernalia you wonder? I ran up and down the hill with weights, tapping the iron gate at the top with each ‘summit’ of the hill. I used the battle ropes in their usual manner at first…which I should have known was not going to be all I’d do. Kale then had me pull the wheel barrow (full of its accoutrements) up the hill -with Kale lifting the handles but not assisting. So that it did not feel left out, I carried the awkward block of wood up and down the hill a couple times. To round it out, it was my mission to bring the wheel barrow back to Kale’s truck. A man out enjoying the trails with his dog gave me a sideways look and asked if I was gardening. Kale briefly explained the purpose of what I was doing and the guy said he’d never seen anyone do “that” before. Me either, and I was the one doing it!! The following day was to be my longest cycle ever, three hours. 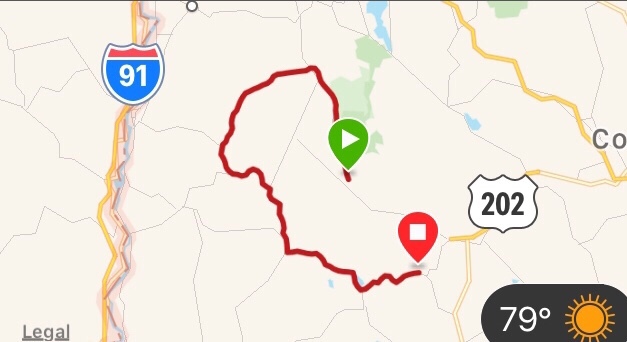 For this ride, my friends -the best abettor- and her wife joined in. I mapped out a route near where they were attending a wedding that evening. Figured the roads would be quieter and they would be closer to their destination should we be slower than anticipated. That all proved accurate…and then some. The roads were quiet and they were also steep. So steep that I couldn’t even pedal in the easiest gear, I had to walk the bike. Ended up doing this multiple times. I guess the road names should have been an indicator: Lear Hill Road, Hill Road, you get the idea. The landscape was delightful and scenic as we rode through some one horse towns. We stopped near the halfway point and after looking at the time, realized we needed to get going if my friends were going to make the wedding. We had a bit of cellular service which provided us a means to reroute and we were off. What cell service we had was quickly lost as we pedaled downhill into a valley. The road winded with one exhilarating hairpin turn, the best section of the ride! Coming to a junction, we were unsure which direction to head. Consulting the map we had looked at previously -it was still open to the map but did not show our location- we decided to go right. What we didn’t know was that the winding turns and scenic rivers were bringing us further from our cars. Tired, hungry and achy we pedaled on, waiting for a street sign for some indication of where we were. We came to a junction with a trail I’d hiked -the Monadnock Sunapee Greenway. Uh oh. Now, I realized we were farther south than we wanted to be. Feeling defeated, I checked my phone over and over as we rode hoping for just the smallest sign of cellular service. Finally, on a downhill, I hollered out and we stopped. We were 16 miles away, it was 3:30 and the battery on my phone was nearly depleted. Jumping into action like I’ve never seen before, my two friends were amazing. While I was still trying to wrap my head around the situation, one was dashing to houses asking for a ride. The other was on the phone trying for an Uber (not surprisingly none were available). Next plan of attack, lock the bikes up and put our thumbs out. This had little effect, no one gave us a glance. Finally a truck was pulling into the side road so we hit him up for a ride. He could only take us to a corner store but that was better than nothing and we hoped we could hitch a ride from there. Bikes in the back, the three of us jumped in thankful for kind people. At the store, we locked up the bikes knowing we wouldn’t be lucky enough to get another ride in a truck. My abettor ran into the store and was able to score someone to bring us before we finished locking the bikes. Everything happened so fast. The next thing I knew I was sitting in my car, wondering what the hell had happened. My mind was spinning, I was starved and realized I didn’t have my wallet. While my two friends dashed off to the wedding, yes they were late, I headed to the store to retrieve our bikes and ask if my wallet had been turned in. Sadly, it hadn’t. My mind was still racing as I drove the hour or so home. I emptied out everything and asked John to take a look for the wallet as well. No luck. In bed, around 10:30, I received a call from an “unknown caller”. I hesitated but then picked up, it was the police department for the town I was in. Someone had turned in my wallet!!! Everything was intact, and though I had already cancelled my credit and debit cards I was so happy that I didn’t have to get a new license. I drove up the next day and offered a reward for the kind person who turned it in, but the police didn’t take down the persons information. I’ve said a million thank-you’s to the universe for helping us through that epic cycling adventure. It is surely one I will never forget. And if you’re wondering…yes we should have taken a left. I’m really enjoying you adventures and writings! Thank you, I’m glad you’re enjoying it!